Though some nice micrographs like what you can find on the front page of this module would be great, your TEM results may have revealed nanowires that are not uniform in their appearance or in their gold coating. Fortunately, even ugly-duckling nanowires may serve beautifully when assembled into a battery. The question you'd like to address is if a battery electrode made from gold nanowires (+ some percentage of silver) performs better than a battery made with a solid, gold foil electrode. And having included silver in the templating, how does the % of that metal affect the voltage potential and the charging of the battery? To answer these questions, you will assemble your nanowires into a battery, mixing a known percentage of the active nanowire material, with a small amount of conducting material and a small amount of binding material. The conducting material we'll use is a graphite carbon called “Super P”. The binder is a kind of teflon called polytetrafluoroethylene, or PTFE for short, that will hold the nanowires and carbon conductor together. The nanowires, carbon and teflon will form a flexible film that you'll roll out like cookie dough and that will serve as the electrode (shown in black in this image) for your battery. The electrode will then be moved into a glovebox to be assembled with the lithium and the electrolyte, and pressed into a coin-type casing. Some of today's lab protocol will require that we work in small groups in the Belcher lab. We'll be using their balance to measure very small masses of material and their glove box to assemble the batteries. As visitors to their lab, please be respectful of their time, equipment and space. When you are not busy measuring the materials to assemble in your batteries, please examine these images and prepare one as if it were to be a figure in a research article (see the FNT assignment, below). Also please post a summary comment about the images to the talk page of today's wiki. You'll need to make some careful mass measurements and then mix the nanowires: carbon (= Super P): teflon (PTFE) at the correct ratio of 70% nanowires:25% Super P:5% PTFE. All material should be isolated and ground to form a powder. This powder is what will be used to make the battery electrodes. In small groups, visit the Belcher lab (2nd floor of building 16). The mortar with your nanowires will be there drying in their vacuum oven. Bring your notebooks, a calculator, and carry (don't wear) some latex gloves. Use the Belcher lab's analytical balance to measure the mass of nanowire powder. Add this mass to a clean mortar. Grind the nanowires for 5 minutes. You and your lab partner(s) can take turns grinding. While you're not grinding determine the mass of Super P and PTFE to be add based on the mass of the nanowires. Measure out Super P and add to mortar. Do not add PTFE yet! Grind thoroughly with mortar and pestle for about 20 minutes. Add PTFE and mix together, use the pestle to press the mixture into a flat sheet that is all one piece. 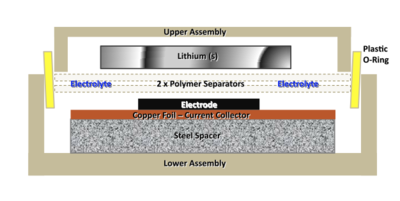 Transfer to a stainless steel plate and roll out the electrode to form a uniform electrode. Once rolled, transfer to the stainless steel cutting plate and use a circle cutter to make an electrode. Measure mass of the electrode (you'll need this to calculate your battery's capacity). The electrodes have to dry before they can be assembled into a battery so before the next lab, this will be done for you in the glove box in the Belcher lab. Today you will have an opportunity to see a demonstration of the assembly with materials that have been prepared in advance. Read the introductory material for the battery testing lab, and then, based on the mass of the active electrode material you've made, determine the number of mA to apply in order to fully discharge the battery in 10 hours. Use the loading factor of 51 mA/g, a value that is in accordance with previously tested gold nanowire electrodes. You should be well on your way to your final presentations of a research idea. Review the required elements for your presentation that are noted here. This page was last edited on 7 December 2009, at 09:59.